Can you imagine the look on your guests face when they come to visit you and they walk in the front door to a beautifully landscaped courtyard pool? The owners have enjoyed the home immensely for its layout favorable for entertaining. 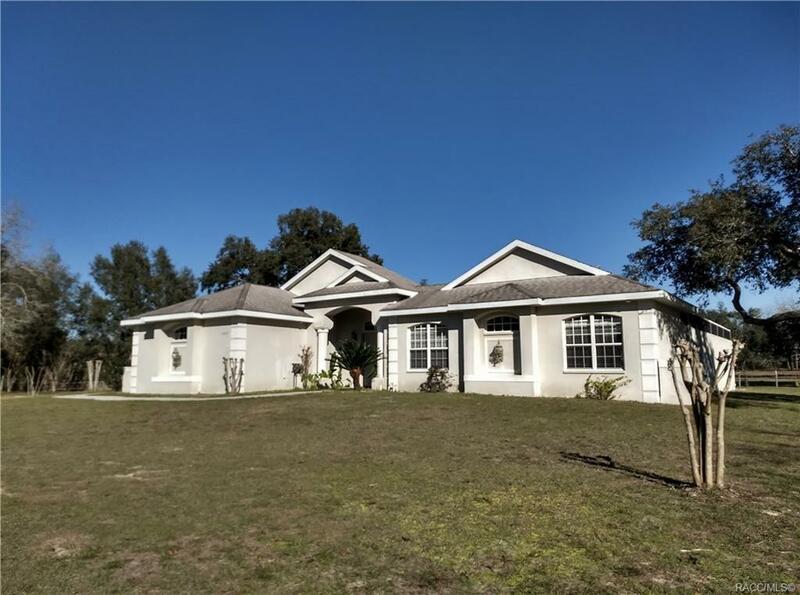 Private setting but close to horse trails, grocery stores and the new extension of the Suncoast Parkway. Enjoy your morning coffee on the screened in pool deck or on the back screened in porch overlooking the pasture. Main house had 3 bedrooms, 3 baths and attached guest house has 2 bedrooms and 1 bath. Several sliding doors open out to an in ground pool in courtyard in the shape of Mickey Mouse. Bring the "chef" in you and cook wonderful meals in this updated kitchen with granite and corian counter tops all while watching your family enjoy the pool area . Courtyard had plumbing and electric in place for a summer kitchen. 2 car garage. Large pasture for horses, cows etc. Don't miss out on this opportunity! Directions: Cardinal Lane To Elsie Point. Home On The Left.